As part of a planned expansion of its North American business, Maxim Group, a manufacturer of cosmetic products, performed an evaluation of its safety and quality assurance procedures, specifically those related to the glass containers for their cosmetics. After this evaluation, they decided to partner with METTLER TOLEDO to install a vision system to perform additional quality inspections. The renewed focus on the quality of their glass containers sprang from regulations in the US related to consumer safety. Maxim was already compliant with the standards and good manufacturing practices of the IFS, but made a consious decision to take another step in securing their production lines by installing a vision inspection solution. The glass containers used in Maxim's production process come from outside suppliers. These suppliers have their own quality assurance process, but Maxim wanted an additional layer of quality assurance before the filling process. The vision inspection system performs a two-stage inspection on the glass containers. One camera inspects for glass shards, while another set of cameras inspects for chipped tops or flaws in the threads of the sealing face. Flawed containers are removed from the production line, and the containers that pass inspection are sent along into the production process. In addition to preventing recalls, the system's presence reduces the occurrence of problems during the filling process, preventing stoppages caused by broken glass and improving the overall throughput of the production process. The system's connection with Maxim's production network allows the company to remotely monitor the production process, and carry out remote maintenance when necessary. 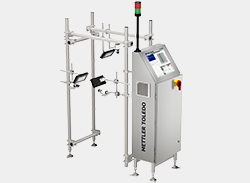 Ultimately, by performing glass inspection, the METTLER TOLEDO vision inspection system is able to provide an important point of control over the quality of the products. The system both prevents damaged containers from causing trouble during the production process, and enables the company to make further improvements to their production process by providing detailed runtime statistical data. This makes the system a critical control point in Maxim's quality control process.